Ideal for DIY healthy and natural snacks. Suitable for fruits, vegetable and meat. Uses hot air circulation drying system with adjustable temperature settings from 35°C to 70°C. 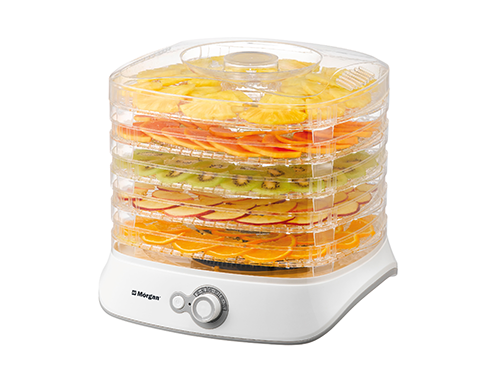 With built-in ventilator for freshness, nutrition seal dehydrator and safety overheating protection. Includes 5 trays and stackable up to 5-tiers with adjustable height. Transparent trays allows for easy checking on food progress. Material of stackable tiers: Polystyrene plastic. Dishwasher safe trays and cover only. Individual tray size: 34.5(L) x 29.5(W) x 4.6(H) cm. Maximum size: 34.5(L) x 30(W) x 32(H) cm.